The goal of this article is to provide our readers with helpful hints to insure better or improved results when they clean floor tile. Many times these simple things are forgotten or overlooked and they can make a difference between a great looking floor and a floor that is average looking. It cost no more to remember to follow and employ these helpful hints and troubleshooting tips. Top scrubbing is a method of cleaning that is used for deeper cleaning. Clean floor tile that is heavily soiled will require this method of cleaning floors. It has two basic reasons for cleaning. Deep cleaning in preparation for recoating with a floor finish (wax). Always dust mop prior to performing any wet scrubbing procedures such as top scrubbing. Always use a professional grade floor cleaning chemical. The smart and recommended floor cleaner is a cleaner that is third-party certified as Green. Always assemble and set up all your equipment, cleaning chemicals, supplies, tools, etc. This will reduce the chance of errors in the procedural process and same time. Always use a mop and bucket with clear rinse water to trail mop to pick up cleaning solution in hard to reach areas such as corners, edges, around fixtures and trails left by auto scrubbers. Always utilize the 4 principles of cleaning. Especially in heavy soiled floors when you clean floor tile…Temperature, Agitation, Chemical and Time. 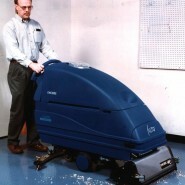 Always work in smaller areas when using a rotary single disc floor machine. This will prevent the cleaning solution from drying on the floor prior to being removed from the floor. This will help prevent soil from being re-deposited to the floor if the solution dries on the floor prior to being picked up. Always use a detailing edge tool when you clean floor tile. This will assist in a thorough cleaning of the floor and the edges. It can make the difference in a floor looking clean and one that does not look clean. The details matter when performing tasks to clean floor tile.